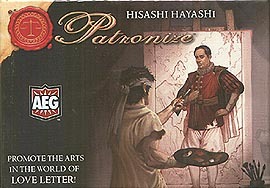 Patronize is a fast and fun trick-taking game from Japanese designer Hisashi Hayashi (Trains Sail to India). It's a time of upheaval; the arts and sciences are flourishing. Now is your chance to gather fame and honour by becoming a patron of the best and brightest minds. Will you succeed, or will history forget your name? As a patron, knowing when to strive for fame, when to maintain a low profile, and when to sit back and profit fro others' work will determine your fate!